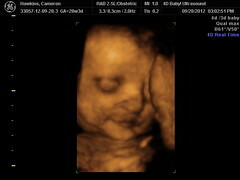 Logan and I took Cameron for a 4D ultrasound last week. 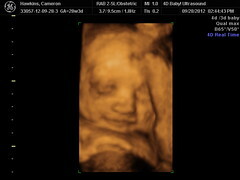 I tend to find the 4D pictures a little creepy, but these seem to have come out well. It took a considerable amount of probing, prodding and position changes to get Tango into the right spot, but eventually she accommodated us. The technician assured us that she could tell Tango had a lot of hair, which led me to ask whose baby it really was. As promised; delivered. 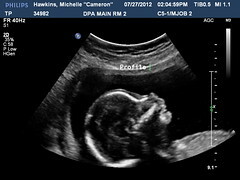 The latest ultrasound pics of Tango. Presumably, at some point soon, we’ll begin narrowing down the list of names that are appropriate to call a baby. Here you can see a pic of Tango’s profile. The doctor noted that her cheekbones are already calcifying, which I presume means she’ll inherit her mother’s beautiful cheek structure. 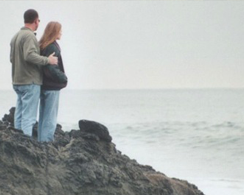 This photo points out the physiological proof of Tango’s gender. I’m not a perinatal physician or an ultrasound technician, so I’m entirely certain what kind of proof this is. I can, however, read clearly typed English, so I can easily determine that this is, in fact, a girl. Lastly we have the obligatory photo where the baby looks more like a creepy alien, and less like a cuddly wuddly diaper filler. 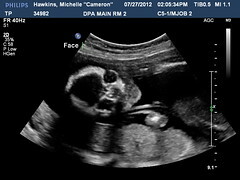 Tango’s gender has been confirmed via ultrasound as female. Logan will be getting a little sister for Christmas. Grainy photos to follow. 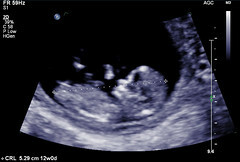 This is a picture from an 11 week ultrasound. It’s about three weeks old, and the due date is the second week of December. The doctor says everything looks normal. 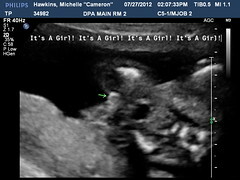 We don’t know what the gender is yet, but I’m calling it as a girl. We’ll see. For now were just calling the baby Tango.